It’s fairly clear when one should buy a particular stock. One should buy stock when it is undervalued. What I have always wondered about is how much stock one should buy. A few months ago I stumbled upon the answer which is given by the Kelly criterion. It says that one should invest an amount to maximize one’s expected growth rate. Surprisingly, this gives a clear, easy to compute amount to invest. Take a moment right now to guess. Remember you get to play as many times as you like. Now let’s do the computation. Suppose your staring worth is w and you bet a fraction f of your funds. If you win, your return is 1.1×f×w, giving you a growth rate of ln(1 + 1.1×f). If you lose, you lose your bet f×w, yielding a growth rate of ln(1 − f). 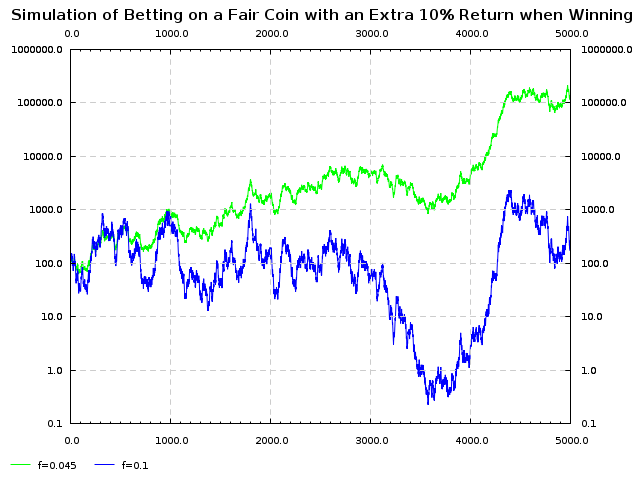 Because the coin is fair the expected return rate is 0.5×ln(1 + 1.1×f) + 0.5×ln(1 − f). Go ahead and plug your chosen fraction f into the formula above and see what number you get. If you chose more than 9.1% then I’m sorry, your growth rate is negative. Because you are betting a fraction of your money you will never lose it all; however, if you are betting too much your expected funds will tend towards 0, even though the odds were in your favour. Below is a plot of the growth rate versus the fraction bet. Some simple calculus shows the the maximum expected growth rate is about 0.11% per round and occurs when you bet about 4.5% of your funds. To illustrate the effect of overbetting, below is a simulation of two players playing 5000 rounds of this game, each starting with $100. The blue player is betting 10% of their funds each round while the green player is betting 4.5% of their funds each round. The blue player may end up ahead in the short run, in the long run it will be nothing but ruin. Please take note of the logarithm scale. There are more sophisticated questions you can answer. For example, you may want to maximize your returns in 10 years while ensuring that you have a 95% chance of having at least $x after those 10 years. Unfortunately that sort of statistical analysis is beyond my skills at the moment. So what is the answer to the question, how much should stock should I buy? The answer is probably less than you think. The most important lesson is, if you buy too much, you will eventually be ruined, even if the odds are in your favour.